The June 9, 2016, meeting has become a focal point for Congressional investigators and the Special Counsel’s office as they continue the probes into Russian interference in the 2016 election. Given the above events, the Agalarovs’ involvement is of particular interest to investigators. Aras Agalarov, who was once referred to as “the Donald Trump of Russia,” is a Russian billionaire and real-estate developer whose willingness to take on beleaguered government projects as a display of unwavering loyalty to the state has earned him a spot in President Vladimir Putin’s inner circle. Agalarov, who was born in Baku, Azerbaijan, founded the Crocus Group in 1989 and began building his business empire in Moscow in the 1990s. According to Forbes, he is currently worth an estimated $1.7 billion, a fortune he has amassed over decades of building commercial and residential real estate in Russia. Many of his undertakings have been government contracts; others relied on funding from Russian state banks that the U.S. Treasury Department sanctioned in 2014, most notably Sberbank. After years of taking on state contracts for challenging projects, such as Vladivostok’s Far East Federal University, Agalarov won a spot at the conference table during Putin’s annual meeting with Russian oligarchs in December 2017. The timing of his ostensible foray into Putin’s good graces also coincides with his reported role in Russian interference in the 2016 U.S. presidential campaign, when Agalarov helped set up a meeting between the Trump campaign and the Russian government attorney, Natalia Veselnitskaya, promising “dirt” on Trump’s political opponent. Both Emin and his father have relatively close relationships with Trump, dating back to the 2013 Miss Universe pageant the Agalarovs hosted in Moscow. They paid Trump between $14 million and $20 million to bring the competition to Russia, and both father and son regularly attended business meetings and social events with Trump throughout the weekend of the pageant. Together with Herman Gref, Putin’s former economy minister from 2000 to 2007 who now heads the Russian bank Sberbank, Agalarov organized a two-hour dinner with Trump and a dozen of Russia’s top businessmen. Agalarov also reportedly “acted as a liaison between [Trump and Putin], even delivering a gift to Trump from Russian President Vladimir Putin after the latter canceled a planned meeting” prior to the pageant. The Agalarovs’ business dealings with Trump extend far beyond the Miss Universe pageant, however, and the three have remained in close contact since Trump’s trip to Russia. Through Emin’s publicist, Rob Goldstone, the Agalarovs were instrumental in setting up the pivotal June 9, 2016, Trump Tower meeting. According to communications that have since come to light, following an alleged meeting Agalarov had with the Prosecutor General of Russia (a position equivalent to the United States Attorney General), he and Emin helped arrange a meeting between Donald Trump Jr., Jared Kushner, Paul Manafort, and a Russian government attorney, Natalia Veselnitskaya, who promised damaging information on Hillary Clinton, Trump’s campaign rival (Agalarov has denied the meting with the Prosecutor General). This overture, eagerly received by Trump’s camp, was described as part of the Russian government’s support of Donald Trump’s campaign for the presidency of the United States. Others present at the meeting were Goldstone, Crocus Group executive Irakly “Ike” Kaveladze, Russian lobbyist Rinat Akhmetshin, and a translator. The full significance of the Agalarovs’ involvement in this meeting can be better understood through a closer look at their burgeoning business empire and increasingly close ties to the Russian state. One measure of a given oligarch’s or private conglomerate’s standing with the Russian state is the volume of their state contracts. Even though the Crocus Group does not work in the strategic sectors of extractives such as oil and gas, the Agalarovs’ development holding company nevertheless enjoys state patronage in the form of lucrative government contracts and favorable loans from state-owned banks, particularly in recent years. Taken together, these indicators point to the Agalarovs’ ascendancy in Russia’s oligarchic circles and power structures. Business overview: The Crocus Group was founded in 1989 and, according to the company website, is “responsible for over 4 million total square meters of developed property.” Agalarov serves as the president of the company, with Emin as the executive vice president. The Crocus Group’s work includes both commercial and residential real estate: major commercial projects include Crocus Expo and Crocus City Hall (where the 2013 Miss Universe pageant was held); major residential projects include Agalarov Estate and Sea Breeze, “an elite housing development in Azerbaijan.” The company has numerous subsidiaries, including Crocus Invest, Crocus International, and Crocus Bank. Sberbank Loans: The Crocus Group has a deep relationship with Sberbank, one of the largest Russian state-owned banks, which is currently under U.S. Treasury sanctions. The Crocus Group and Sberbank have signed numerous funding agreements over the years, including a 53-billion-ruble loan, part of a total 76-billion-ruble investment package in 2013 that, at the time, was reportedly the largest loan Sberbank had ever given for a development project. In a 2015 interview with the Russian business journal Vedomosti, Agalarov said that his company had an outstanding debt to Sberbank in the amount of $1 billion. The Crocus Group holds debt in both rubles and dollars. Some of their most extensive commercial projects are the “Vegas” mega-malls; construction for the fourth Vegas mall, also financed by Sberbank, is currently underway. The Crocus Group has received many Russian government contracts, which have traditionally signaled the recipients’ favorability status and proximity to the Russian state. Eurasion Economic Union: In 2014, the Crocus Group was reportedly included in a “bilateral treaty with the government of Kyrgyzstan to help the Central Asian country integrate into Russia’s regional alliance, the Eurasian Economic Union,” which was founded in 2015 as Russia’s alternative to the European Union, seeking to advance “regional economic integration” between the member states of Russia, Kazakhstan, Belarus, Armenia, and Kyrgyzstan. The deal designated Agalarov’s company as the supplier of services “to integrate the two countries’ bureaucracies and reinforce the new customs common border, by, for example, building new border posts.” The Crocus Group’s contract included plans for developing infrastructure and constructing new customs checkpoints. According to reports, the Crocus Group has received between $127 million and $145 million for construction work related to the border posts. Granting the contract to the Crocus Group was largely seen as an example of favoritism by the Kremlin, as the contract was given to a company deemed close to Putin and there was reportedly no competitive bidding process. Moscow Central Ring Road: The Crocus Group has continued to receive a steady stream of government tenders in recent years. In 2015, they received a contract for the first section of the highly anticipated Moscow Central Ring Road, an ambitious project that will eventually encircle the entire city. The Central Ring Road is a complex endeavor that has garnered a lot of coverage in the Russian press. It has, however, proven to be more problematic than originally expected. The portion of the road that the Crocus Group is building was initially assigned to StroyGazConsulting, a construction company partially controlled by state-owned Gazprombank, an entity U.S. Treasury sanctioned along with Gazprom in 2014. Reported financial difficulties prompted a reassignment of the contract to the Crocus Group. They reportedly received 42.1 billion rubles of government funding for the road, which is scheduled to be completed by the end of 2018. Agalarov has conceded that the project may not be as profitable as he had initially hoped. Among other things, the Crocus Group’s section of the project has run into issues with pipelines and other transmission lines that run across the land on which the road is being built. Far Eastern Federal University: Until this year, perhaps the highest-profile project the Crocus Group executed was the new campus of the Far Eastern Federal University, built on Russkiy Island off the coast of Vladivostok for the 2012 Asia-Pacific Economic Cooperation (APEC) summit. The original state contract awarded to the Crocus Group was in the amount of 42 billion rubles. Agalarov claims he spent an additional 3.6 billion rubles of his own funds to complete the project. The Crocus Group later appealed to recover 1.9 billion rubles in court, and was eventually awarded less than a billion rubles from the various state ministries in total. Although Agalarov has been up front about the fact that the Crocus Group did not profit from the APEC project, the undertaking has arguably endeared him to the Kremlin. His success with this project helped him win their next biggest prize, contracts to build two stadiums for the 2018 World Cup hosted in Russia. The Crocus Group has received all funding for these stadiums from the Russian state. In the aforementioned 2015 interview with Vedomosti, Agalarov said that his company had not taken any bank loans to finance the World Cup construction projects. 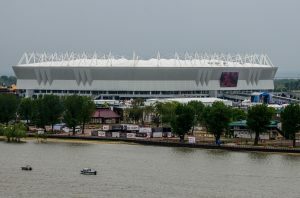 In a 2018 interview, Agalarov stated that the two stadiums, in Kaliningrad and Rostov-on-Don, yielded contracts worth a total of 36 billion rubles (approximately $580 million in accordance with June 2018 conversion rates). 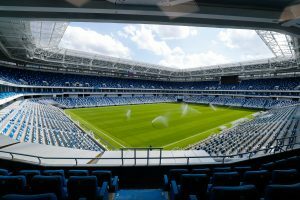 The Crocus Group’s construction of the World Cup stadiums is especially interesting in light of a portion of the Steele Dossier, compiled by former British intelligence officer Christopher Steele, which alleges that “the Kremlin’s cultivation operation of Trump also had comprised offering him various lucrative real estate development business deals in Russia, especially in relation to the ongoing 2018 World Cup soccer tournament. However, so far, for reasons unknown, Trump had not taken up any of these.” Trump’s existing relationship with the Agalarovs—namely when hosting Miss Universe together as well as negotiating a deal for a Trump tower in Moscow—raises the question of whether they may have served as conduits for the propositions alleged in the dossier. To date, no evidence to support this has come to light, and Trump has denied the allegations in the dossier. The Crocus Group’s involvement in the World Cup is also interesting in the context of earlier work done by Steele. It was reported that the English Football Association hired Steele to investigate whether other nations competing to host the 2018 World Cup were bribing Federation Internationale de Football Association (FIFA) officials. Steele found considerable evidence that Russia engaged in a widespread influence campaign and reported this to the Federal Bureau of Investigations (FBI), which helped prompt the indictments of of several members of FIFA’s leadership. Given this earlier investigation, it is possible that before working on the Trump dossier, Steele already had a source network in place from the FIFA investigation that may have shed light on any possible World Cup-related offers to Trump. Though no corruption-related charges against the Crocus Group have been raised, the broader pattern of corruption in Russia and a reported tendency for the Kremlin to award contracts without proper bidding procedures provides troubling context and warrants scrutiny. While not all of the government contracts have turned out quite as lucrative for Agalarov’s companies, the projects’ high profile and strategic importance have apparently raised his standing in the eyes of Putin. After the 2012 APEC conference, Putin even awarded Agalarov the Order of Honor. Among other things, Agalarov’s recent ascent into Putin’s inner circle is evidenced by his attendance at Putin’s most recent oligarch dinner, his first time attending the event. Agalarov’s public statements have also fallen strictly in line with the Kremlin talking points; he has, for example, stated that he is not opposed to taking on future projects in Crimea, the Ukrainian territory Russia annexed in 2014. In addition to his apparent willingness to take on whichever project Putin tosses his way, his standing with the government may have even gotten a boost as a result of his relationship with Trump. As Mother Jones noted, the Crocus Group was granted approval by Moscow’s city-planning and land commission “to begin constructing a sprawling shopping and entertainment complex in the Moscow suburbs” just two days after the Agalarovs’ role in arranging the Trump Tower meeting was revealed. Agalarov has not commented on the timing of this approval. Another parallel between Trump and the Agalarovs is their affinity for building opulent golf courses, a concept relatively novel in Russia. This commonality is worth considering in light of questions raised about the possible Russian sources of funding for Trump’s golf courses during the recession. The Crocus Group’s most well-known residential project and golf course is the Agalarov Estate, an exclusive community for the nouveau riche Russians. The Agalarov Estate has been at the center of some controversy, as the owners of a village adjacent to the development originally refused to sell their land to the Crocus Group, accusing Agalarov of attempting to force them off their property. Despite these issues, Agalarov boasted of the estate’s amenities in a 2007 interview, which include a private school, artificial lakes, waterfalls, a spa resort, and most interestingly, a golf course. Historically, golf has not been especially popular in Russia, which makes it easy to believe that Agalarov’s interest in the golf course stemmed more from the “aura of exclusivity” than from his interest in the game itself. Other oligarchs have built luxurious golf courses, including Oleg Deripaska, Vladimir Potanin, and Roman Abramovich, whose luxury Skolkovo golf course cost $25 million.The concept of using golf as a symbol of wealth and status has, of course, also been used by Trump, who owns seventeen golf courses around the world. The question of whether Russian money was used to fund these golf courses was raised after a 2014 quote from Eric Trump surfaced. He reportedly told a golf reporter that the Trump Organization was able to finance their golf courses during the recession because “We don’t rely on American banks. We have all the funding we need out of Russia.” He reportedly continued, “We’ve got some guys that really, really love golf, and they’re really invested in our programs. We just go there all the time.” Trump has since denied making this statement. Agalarov’s U.S. business interests are likely handled by Irakly Kaveladze, a U.S.-based Vice President of the Crocus Group. Kaveladze was previously scrutinized by Congress for his financial activity. Specifically, in 2000, the New York Times reported on the findings of a Congressional inquiry and a Government Accountability Office (GAO) report explaining the ease with which foreigners could hide their identities and use shell companies to launder money through American banks. This inquiry examined the activity of Kaveladze, who had created more than 2,000 corporations in Delaware for various Russian individuals and subsequently opened bank accounts for these anonymous corporations. Former Senator Carl Levin, who requested the initial inquiry, referred to Kaveladze as a “poster child” for using shell companies to launder money; however, Kaveladze was not charged with any crimes as a result of the inquiry and has denied any wrongdoing. Kaveladze, Agalarov, and Emin are associated with several companies incorporated in the United States, a number of which are linked to the same address in Englewood Cliffs, New Jersey. Public records link the above address to entities like Corsy International, IBC Group, Inc., CI Publishing Inc., PB Consulting, Russian Art Mall, and RJI Properties. It is unclear which of these entities remain active, or even what their purposes are or have been; some are listed as banking and investment-consultant companies, while others are listed as business-consulting services. Both Aras Agalarov and his son Emin have a longstanding relationship with Donald Trump, Donald Trump Jr., and the Trump Organization. Even before their relationship began, Trump had already attempted to do business with one of Agalarov’s close associates. In June 2011, Trump and Ivanka met with Igor Krutoy, a Russian entertainer and entrepreneur well acquainted with the Agalarovs, to discuss “plans to build a glitzy hotel and entertainment complex” in Riga, Latvia. Krutoy was later questioned by Latvia’s Corruption Prevention and Combating Bureau as part of a criminal investigation, although no charges were filed. The prospective deal ultimately fell through, but Trump would later go on to collaborate with Krutoy’s acquaintances, the Agalarovs, on the 2013 Miss Universe pageant in Moscow. In a 2017 interview, Emin Agalarov recounted how he and his father wanted to bring the pageant to Moscow and hold it at their venue, Crocus City Hall. The two men flew to Las Vegas in June 2013 for the Miss USA pageant, also owned by Trump at the time, “with the ambition to sign a contract [for the pageant].” Trump reportedly took a liking to them, incorrectly identifying Aras Agalarov as “the richest man in Russia.” During that trip, the Agalarovs and Irakly Kaveladze dined with Trump, his personal attorney Michael Cohen, and Emin’s publicist Rob Goldstone. Trump subsequently announced that the next Miss Universe pageant would be held in Russia, signing the contract with the Agalarovs during that Vegas trip. On November 8 and 9, 2013, Trump visited Moscow for the Miss Universe pageant, for which he was reportedly paid as much as $20 million. During this trip, Trump acquainted himself with numerous Russian businessmen and politically-connected individuals. He dined at Nobu with Herman Gref, chief executive of Sberbank and former Russian Minister of Economics and Trade from 2000 to 2007, and “a dozen of Russia’s top businessmen.” That weekend, Trump also filmed a scene for one of Emin Agalarov’s upcoming music videos in the Moscow Ritz-Carlton. While Trump was in Moscow, Agalarov reportedly attempted to facilitate a meeting between Trump and Putin. He delivered a private message “from the Kremlin” stating that Putin wanted to meet Trump, and then delivered a second message stating that Kremlin spokesman Dmitry Peskov would soon be calling Trump. Although Peskov did reportedly call Trump (on Agalarov’s cell phone), the meeting between Trump and Putin never happened, much to Trump’s disappointment. However, after Trump returned to New York, Agalarov’s daughter reportedly brought “a gift for Trump from Putin,” consisting of a box with a sealed letter inside. Trump’s 2013 Moscow trip often comes up in the context of the Steele Dossier, which alleges that Russia obtained kompromat on Trump during his time in Russia. (This allegation has been neither corroborated nor disproven, although the Trump administration denies that it occurred.) Allegations of kompromat aside, it is clear that the trip allowed Trump to deepen his connections to Russia through his friendship and business partnership with the Agalarovs, and that the trip, which would not have been possible without the Agalarovs, solidified Trump’s high opinion of Russia and Putin. It is against this background of Trump’s relationship with the Agalarovs that the meeting—today at the center of the Special Counsel Robert Mueller’s probe into Russia’s attempts to meddle in the 2016—took place. On June 9, 2016, Natalia Veselnitskaya, the Russian government attorney who was described as having “dirt” on Hillary Clinton as part of the Russian government’s effort to support the Trump campaign, met with Donald Trump Jr., Jared Kushner, and Paul Manafort at the Trump Tower in New York. On June 7, 2016, Trump Jr. and Goldstone set up the meeting for June 9, 2016, in Trump Tower. Trump Jr., Kushner, and Manafort attended, as did Goldstone, Kaveladze, Russian lawyer and Magnitsky Act opponent Natalia Veselnitskaya, and lobbyist and rumored former counterintelligence officer Rinat Akhmetshin, along with a translator. Kaveladze reportedly attended this meeting as a representative of the Agalarovs, and has claimed he was unaware of the purpose of the meeting. According to the Trump campaign, the group discussed “adoptions,” believed to be code for the discussion of the American sanctions bill known as the Magnitsky Act, to which Putin responded by banning America adoptions of Russian orphans. Yuri Chaika: One of the strongest links between the participants in this meeting and the Russian government may be Yuri Chaika’s purported involvement, which Trump Jr. has denied. Chaika’s role raises the question of whether the Russian government was directly involved in orchestrating the meeting through convenient intermediaries. In fact, the June 9 meeting would not have been the first time Chaika had allegedly tried to pass Russian materials to U.S. individuals; months before the Trump Tower meeting, Chaika’s office reportedly gave U.S. Congressman Dana Rohrabacher a memo that was similar to the memo that Veselnitskaya reportedly brought with her to the June 9 meeting (Veselnitskaya has reportedly said she and Chaika are acquaintances). This memo contained a narrative suggesting that Clinton had benefited from what Veselnitskaya alleged to be large-scale fraud in Russia and advocating for the repeal of the Magnitsky Act. It is interesting to note that the relationship between Aras Agalarov and Chaika extends beyond this encounter. After Russian opposition leader Alexei Navalny published a 2015 investigation into alleged corruption by Chaika and his family (this corruption is unrelated to the individuals linked to the June 9 meeting,) Agalarov penned a lengthy op-ed defending Chaika in the Russian publication Kommersant. In this piece, Agalarov stridently defended Chaika, in some instances using his background in construction to defend the validity of Chaika’s alleged investments. Chaika has denied all wrongdoing. In order to fully evaluate the significance of Trump’s relationship with the Agalarovs, one must first understand who the Agalarovs are, the depths of their relationship with Trump, and the strength of their ties to the Kremlin. Just like Trump, the Agalarovs have built an extensive real-estate empire, working on both commercial and luxury residential projects as well as golf courses. Many of their projects have been funded by state banks and represent government contracts, both indicators of government patronage and a close relationship with the Kremlin. The Agalarovs’ relationship with Trump began during the 2013 Miss Universe pageant and deepened in the intervening years, culminating in their assistance in setting up the June 9 Trump Tower meeting. Participants in the meeting have been interviewed by both Congressional investigators and Mueller’s team, and a list of questions Mueller reportedly wants to ask Trump, obtained by The New York Times, contains the the following: “During a 2013 trip to Russia, what communication and relationships did you have with the Agalarovs and Russian government officials?” This meeting linked high-ranking Trump campaign officials to the Russian government and illustrated their eagerness to obtain political “dirt” on their opponent from the Russians, and has since been established as one of the clearest examples of cooperation between the Trump campaign and Russia-linked agents.